Ta Prohm Temple Complex Cambodia, is one of the most atmospheric places in Angkor Wat where the jungle creeps remorselessly through the ruins of the buildings to reclaim the land. Unlike most temples in the Angkor complex, Ta Prohm has been left undisturbed, much as it was when first found. The current structure dates from 1186 A.D. and was built by King Jayavarman VII in honour of his mother. According to the Sanskrit writings on the walls, the area was home to more than 12,500 people, including over 600 dancers, and at the height of Khmer power the temple held thousands of pearls, precious stones and golden dishes. After the fall of the Khmer empire in the 17th century the temple was abandoned until its discovery in the late 19th century. In the late 19th century Ta Prohm was discovered by the French but fortunately for today’s visitors they decided not to do a full-scale restoration of the temple. This was partly because giant trees, such as ficus and silk tree, were so merged with the ancient buildings and walls that they seemed as one. We now see this unique complex in a somewhat similar state to what it was when originally discovered. Much later it was decided that Ta Prohm would be left “as a concession to the taste for the picturesque” as it it had merged well with the jungle. Work has had to be done however, to stabilize the ruins. With minimal restoration, stone pillars and carvings intertwine with massive tree roots and jungle. It is both awesome and inspirational as we see the power of nature to reclaim what is hers. 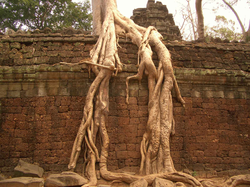 Ta Prohm is known to manywho have not travelled to Cambodia and visited Angkor Wat and many of these images will be familiar to them: the reason? Some of the most impressive scenes in the famous blockbuster film Lara Croft: Tomb Raider were created in and among the ruins. The cinematic adventures if Lara Croft took place among this series of stone walls, fallen temples and pillars that are held in the iron clasp of gigantic roots that seem to squeeze the very essence of the stones. If viewed at dusk, it is not fanciful to say that they appear malevolent. Look beyond the jungle encroachment though and you find walls decorated with carvings of sensuous celestial nymphs and delightful figures peering out of niches in the remaining walls and with a little bit of imagination one can picture the scene in the 12th and 13th centuries when the Kyhmer kingdom was at its height. Nice article! Those trees are unbelievable :). Thank you for sharing, Mari! Amazing photos! There is an eerie effect in watching nature slowly taking over the ruins, the only proof of human activity a long time ago. Great article.